These highlights do not include all the information needed to use CELEBREX safely and effectively. See full prescribing information for CELEBREX. Poor Metabolizers of CYP2C9 Substrates: Consider a dose reduction by 50% (or alternative management for JRA) in patients who are known or suspected to be CYP2C9 poor metabolizers, (2.7, 8.8, 12.3). Most common adverse reactions in arthritis trials (>2% and >placebo) are: abdominal pain, diarrhea, dyspepsia, flatulence, peripheral edema, accidental injury, dizziness, pharyngitis, rhinitis, sinusitis, upper respiratory tract infection, rash (6.1). Carefully consider the potential benefits and risks of CELEBREX and other treatment options before deciding to use CELEBREX. Use the lowest effective dosage for the shortest duration consistent with individual patient treatment goals [see Warnings and Precautions (5)]. For OA, the dosage is 200 mg per day administered as a single dose or as 100 mg twice daily. For RA, the dosage is 100 to 200 mg twice daily. For JRA, the dosage for pediatric patients (age 2 years and older) is based on weight. For patients ≥10 kg to ≤25 kg the recommended dose is 50 mg twice daily. For patients >25 kg the recommended dose is 100 mg twice daily. For AS, the dosage of CELEBREX is 200 mg daily in single (once per day) or divided (twice per day) doses. If no effect is observed after 6 weeks, a trial of 400 mg daily may be worthwhile. If no effect is observed after 6 weeks on 400 mg daily, a response is not likely and consideration should be given to alternate treatment options. For management of Acute Pain and Treatment of Primary Dysmenorrhea, the dosage is 400 mg initially, followed by an additional 200 mg dose if needed on the first day. On subsequent days, the recommended dose is 200 mg twice daily as needed. In patients with moderate hepatic impairment (Child-Pugh Class B), reduce the dose by 50%. The use of CELEBREX in patients with severe hepatic impairment is not recommended [see Warnings and Precautions (5.5), Use in Specific Populations (8.6) and Clinical Pharmacology (12.3)]. In adult patients who are known or suspected to be poor CYP2C9 metabolizers based on genotype or previous history/experience with other CYP2C9 substrates (such as warfarin, phenytoin), initiate treatment with half of the lowest recommended dose. In patients with JRA who are known or suspected to be poor CYP2C9 metabolizers, consider using alternative treatments. [see Use in Specific populations (8.8), and Clinical Pharmacology (12.5)]. 50 mg white, with reverse printed white on red band of body and cap with markings of 7767 on the cap and 50 on the body. 100 mg white, with reverse printed white on blue band of body and cap with markings of 7767 on the cap and 100 on the body. 200 mg white, with reverse printed white on gold band with markings of 7767 on the cap and 200 on the body. 400 mg white, with reverse printed white on green band with markings of 7767 on the cap and 400 on the body. Known hypersensitivity (e.g., anaphylactic reactions and serious skin reactions) to celecoxib, any components of the drug product [see Warnings and Precautions (5.7, 5.9)]. In the APC (Adenoma Prevention with Celecoxib) trial, there was about a threefold increased risk of the composite endpoint of cardiovascular death, MI, or stroke for the CELEBREX 400 mg twice daily and CELEBREX 200 mg twice daily treatment arms compared to placebo. The increases in both celecoxib dose groups versus placebo-treated patients were mainly due to an increased incidence of myocardial infarction [see Clinical Studies (14.7)]. A randomized controlled trial entitled the Prospective Randomized Evaluation of Celecoxib Integrated Safety vs. Ibuprofen Or Naproxen (PRECISION) was conducted to assess the relative cardiovascular thrombotic risk of a COX-2 inhibitor, celecoxib, compared to the non-selective NSAIDs naproxen and ibuprofen. Celecoxib 100 mg twice daily was non-inferior to naproxen 375 to 500 mg twice daily and ibuprofen 600 to 800 mg three times daily for the composite endpoint of the Antiplatelet Trialists' Collaboration (APTC), which consists of cardiovascular death (including hemorrhagic death), non-fatal myocardial infarction, and non-fatal stroke [See Clinical Studies (14.6)]. There is no consistent evidence that concurrent use of aspirin mitigates the increased risk of serious CV thrombotic events associated with NSAID use. The concurrent use of aspirin and an NSAID, such as celecoxib, increases the risk of serious gastrointestinal (GI) events [see Warnings and Precautions (5.2)]. Avoid the use of Celebrex in patients with a recent MI unless the benefits are expected to outweigh the risk of recurrent CV thrombotic events. If Celebrex is used in patients with a recent MI, monitor patients for signs of cardiac ischemia. NSAIDs, including celecoxib cause serious gastrointestinal (GI) adverse events including inflammation, bleeding, ulceration, and perforation of the esophagus, stomach, small intestine, or large intestine, which can be fatal. These serious adverse events can occur at any time, with or without warning symptoms, in patients treated with CELEBREX. Only one in five patients who develop a serious upper GI adverse event on NSAID therapy is symptomatic. Upper GI ulcers, gross bleeding, or perforation caused by NSAIDs occurred in approximately 1% of patients treated for 3–6 months, and in about 2%–4% of patients treated for one year. However, even short-term NSAID therapy is not without risk. Patients with a prior history of peptic ulcer disease and/or GI bleeding who used NSAIDs had a greater than 10-fold increased risk for developing a GI bleed compared to patients without these risk factors. Other factors that increase the risk of GI bleeding in patients treated with NSAIDs include longer duration of NSAID therapy; concomitant use of oral corticosteroids, aspirin, anticoagulants; or selective serotonin reuptake inhibitors (SSRIs); smoking; use of alcohol; older age; and poor general health status. Most postmarketing reports of fatal GI events occurred in elderly or debilitated patients. Additionally, patients with advanced liver disease and/or coagulopathy are at increased risk for GI bleeding. Complicated and symptomatic ulcer rates were 0.78% at nine months for all patients in the CLASS trial, and 2.19% for the subgroup on low-dose ASA. Patients 65 years of age and older had an incidence of 1.40% at nine months, 3.06% when also taking ASA [see Clinical Studies (14.7)]. If a serious GI adverse event is suspected, promptly initiate evaluation and treatment, and discontinue CELEBREX until a serious GI adverse event is ruled out. Elevations of ALT or AST (less than three times ULN) may occur in up to 15% of patients treated with NSAIDs including celecoxib. In controlled clinical trials of CELEBREX, the incidence of borderline elevations (greater than or equal to 1.2 times and less than 3 times the upper limit of normal) of liver associated enzymes was 6% for CELEBREX and 5% for placebo, and approximately 0.2% of patients taking CELEBREX and 0.3% of patients taking placebo had notable elevations of ALT and AST. Inform patients of the warning signs and symptoms of hepatotoxicity (e.g., nausea, fatigue, lethargy, diarrhea, pruritus, jaundice, right upper quadrant tenderness, and "flu-like" symptoms). If clinical signs and symptoms consistent with liver disease develop, or if systemic manifestations occur (e.g., eosinophilia, rash, etc. ), discontinue CELEBREX immediately, and perform a clinical evaluation of the patient. NSAIDs, including CELEBREX, can lead to new onset of hypertension or worsening of preexisting hypertension, either of which may contribute to the increased incidence of CV events. Patients taking angiotensin converting enzyme (ACE) inhibitors, thiazide diuretics or loop diuretics may have impaired response to these therapies when taking NSAIDs [see Drug Interactions (7)]. See Clinical Studies (14.6, 14.7) for additional blood pressure data for CELEBREX. Additionally, fluid retention and edema have been observed in some patients treated with NSAIDs. Use of celecoxib may blunt the CV effects of several therapeutic agents used to treat these medical conditions (e.g., diuretics, ACE inhibitors, or angiotensin receptor blockers [ARBs]) [see Drug Interactions (7)]. In the CLASS study [see Clinical Studies (14.7)], the Kaplan-Meier cumulative rates at 9 months of peripheral edema in patients on CELEBREX 400 mg twice daily (4-fold and 2-fold the recommended OA and RA doses, respectively), ibuprofen 800 mg three times daily and diclofenac 75 mg twice daily were 4.5%, 6.9% and 4.7%, respectively. Avoid the use of CELEBREX in patients with severe heart failure unless the benefits are expected to outweigh the risk of worsening heart failure. If CELEBREX is used in patients with severe heart failure, monitor patients for signs of worsening heart failure. Renal toxicity has also been seen in patients in whom renal prostaglandins have a compensatory role in the maintenance of renal perfusion. In these patients, administration of an NSAID may cause a dose-dependent reduction in prostaglandin formation and, secondarily, in renal blood flow, which may precipitate overt renal decompensation. Patients at greatest risk of this reaction are those with impaired renal function, dehydration, hypovolemia, heart failure, liver dysfunction, those taking diuretics, ACE-inhibitors or the ARBs, and the elderly. Discontinuation of NSAID therapy is usually followed by recovery to the pretreatment state. No information is available from controlled clinical studies regarding the use of CELEBREX in patients with advanced renal disease. The renal effects of CELEBREX may hasten the progression of renal dysfunction in patients with preexisting renal disease. Correct volume status in dehydrated or hypovolemic patients prior to initiating CELEBREX. Monitor renal function in patients with renal or hepatic impairment, heart failure, dehydration, or hypovolemia during use of CELEBREX [see Drug Interactions (7)]. Avoid the use of CELEBREX in patients with advanced renal disease unless the benefits are expected to outweigh the risk of worsening renal function. If CELEBREX is used in patients with advanced renal disease, monitor patients for signs of worsening renal function. Increases in serum potassium concentration, including hyperkalemia, have been reported with use of NSAIDs, even in some patients without renal impairment. In patients with normal renal function, these effects have been attributed to a hyporeninemic- hypoaldosteronism state. Celecoxib has been associated with anaphylactic reactions in patients with and without known hypersensitivity to celecoxib and in patients with aspirin sensitive asthma. Celebrex is a sulfonamide and both NSAIDs and sulfonamides may cause allergic type reactions including anaphylactic symptoms and life-threatening or less severe asthmatic episodes in certain susceptible people [see Contraindications (4) and Warnings and Precautions (5.8)]. Seek emergency help if any anaphylactic reaction occurs. A subpopulation of patients with asthma may have aspirin-sensitive asthma which may include chronic rhinosinusitis complicated by nasal polyps; severe, potentially fatal bronchospasm; and/or intolerance to aspirin and other NSAIDs. Because cross-reactivity between aspirin and other NSAIDs has been reported in such aspirin-sensitive patients, CELEBREX is contraindicated in patients with this form of aspirin sensitivity [see Contraindications (4)]. When CELEBREX is used in patients with preexisting asthma (without known aspirin sensitivity), monitor patients for changes in the signs and symptoms of asthma. Serious skin reactions have occurred following treatment with Celebrex, including erythema multiforme, exfoliative dermatitis, Stevens-Johnson Syndrome (SJS), toxic epidermal necrolysis (TEN), drug reaction with eosinophilia and systemic symptoms (DRESS), and acute generalized exanthematous pustulosis (AGEP). These serious events may occur without warning and can be fatal. Inform patients about the signs and symptoms of serious skin reactions, and to discontinue the use of CELEBREX at the first appearance of skin rash or any other sign of hypersensitivity. CELEBREX is contraindicated in patients with previous serious skin reactions to NSAIDs [see Contraindications (4)]. Celecoxib may cause premature closure of the ductus arteriosus. Avoid use of NSAIDs, including CELEBREX, in pregnant women starting at 30 weeks of gestation (third trimester) [see Use in Specific Populations (8.1)]. Anemia has occurred in NSAID-treated patients. This may be due to occult or gross blood loss, fluid retention, or an incompletely described effect on erythropoiesis. If a patient treated with CELEBREX has any signs or symptoms of anemia, monitor hemoglobin or hematocrit. In controlled clinical trials the incidence of anemia was 0.6% with CELEBREX and 0.4% with placebo. Patients on long-term treatment with CELEBREX should have their hemoglobin or hematocrit checked if they exhibit any signs or symptoms of anemia or blood loss. NSAIDs, including CELEBREX, may increase the risk of bleeding events. Co-morbid conditions such as coagulation disorders or concomitant use of warfarin, other anticoagulants, antiplatelet agents (e.g., aspirin), serotonin reuptake inhibitors (SSRIs) and serotonin norepinephrine reuptake inhibitors (SNRIs) may increase this risk. Monitor these patients for signs of bleeding [see Drug Interactions (7)]. The pharmacological activity of CELEBREX in reducing inflammation, and possibly fever, may diminish the utility of diagnostic signs in detecting infections. Because of the risk of disseminated intravascular coagulation with use of CELEBREX in pediatric patients with systemic onset JRA, monitor patients for signs and symptoms of abnormal clotting or bleeding, and inform patients and their caregivers to report symptoms as soon as possible. Of the CELEBREX-treated patients in the pre-marketing controlled clinical trials, approximately 4,250 were patients with OA, approximately 2,100 were patients with RA, and approximately 1,050 were patients with post-surgical pain. More than 8,500 patients received a total daily dose of CELEBREX of 200 mg (100 mg twice daily or 200 mg once daily) or more, including more than 400 treated at 800 mg (400 mg twice daily). 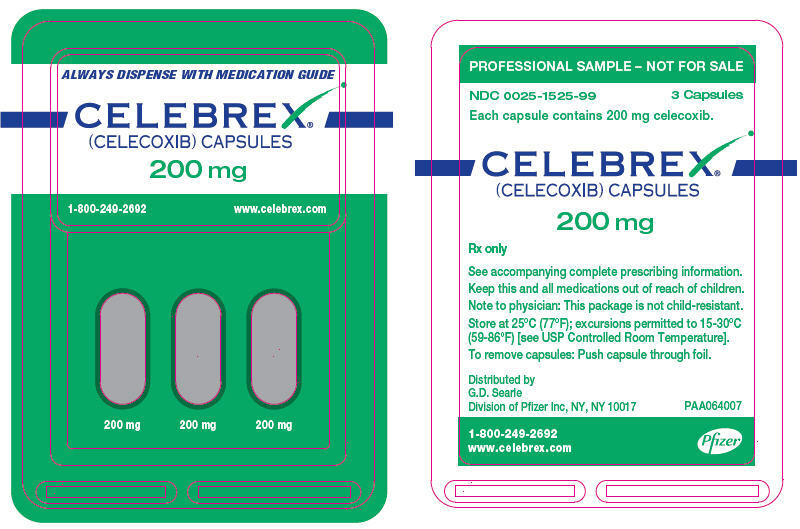 Approximately 3,900 patients received CELEBREX at these doses for 6 months or more; approximately 2,300 of these have received it for 1 year or more and 124 of these have received it for 2 years or more. Table 1 lists all adverse events, regardless of causality, occurring in ≥2% of patients receiving CELEBREX from 12 controlled studies conducted in patients with OA or RA that included a placebo and/or a positive control group. Since these 12 trials were of different durations, and patients in the trials may not have been exposed for the same duration of time, these percentages do not capture cumulative rates of occurrence. IBU = Ibuprofen 800 mg three times daily. Hematological Events: The incidence of clinically significant decreases in hemoglobin (>2 g/dL) was lower in patients on CELEBREX 400 mg twice daily (0.5%) compared to patients on either diclofenac 75 mg twice daily (1.3%) or ibuprofen 800 mg three times daily 1.9%. The lower incidence of events with CELEBREX was maintained with or without aspirin use [see Clinical Pharmacology (12.2)]. Withdrawals/Serious Adverse Events: Kaplan-Meier cumulative rates at 9 months for withdrawals due to adverse events for CELEBREX, diclofenac and ibuprofen were 24%, 29%, and 26%, respectively. Rates for serious adverse events (i.e., causing hospitalization or felt to be life-threatening or otherwise medically significant), regardless of causality, were not different across treatment groups (8%, 7%, and 8%, respectively). In a 12-week, double-blind, active-controlled study, 242 JRA patients 2 years to 17 years of age were treated with celecoxib or naproxen; 77 JRA patients were treated with celecoxib 3 mg/kg twice daily, 82 patients were treated with celecoxib 6 mg/kg twice daily, and 83 patients were treated with naproxen 7.5 mg/kg twice daily. The most commonly occurring (≥5%) adverse events in celecoxib treated patients were headache, fever (pyrexia), upper abdominal pain, cough, nasopharyngitis, abdominal pain, nausea, arthralgia, diarrhea and vomiting. The most commonly occurring (≥5%) adverse experiences for naproxen-treated patients were headache, nausea, vomiting, fever, upper abdominal pain, diarrhea, cough, abdominal pain, and dizziness (Table 2). Compared with naproxen, celecoxib at doses of 3 and 6 mg/kg twice daily had no observable deleterious effect on growth and development during the course of the 12-week double-blind study. There was no substantial difference in the number of clinical exacerbations of uveitis or systemic features of JRA among treatment groups. In a 12-week, open-label extension of the double-blind study described above, 202 JRA patients were treated with celecoxib 6 mg/kg twice daily. The incidence of adverse events was similar to that observed during the double-blind study; no unexpected adverse events of clinical importance emerged. Adverse Events from Ankylosing Spondylitis Studies: A total of 378 patients were treated with CELEBREX in placebo- and active-controlled AS studies. Doses up to 400 mg once daily were studied. The types of adverse events reported in the AS studies were similar to those reported in the OA/RA studies. Adverse Events from Analgesia and Dysmenorrhea Studies: Approximately 1,700 patients were treated with CELEBREX in analgesia and dysmenorrhea studies. All patients in post-oral surgery pain studies received a single dose of study medication. Doses up to 600 mg/day of CELEBREX were studied in primary dysmenorrhea and post-orthopedic surgery pain studies. The types of adverse events in the analgesia and dysmenorrhea studies were similar to those reported in arthritis studies. The only additional adverse event reported was post-dental extraction alveolar osteitis (dry socket) in the post-oral surgery pain studies. Adverse reactions from long-term, placebo-controlled polyp prevention studies: Exposure to CELEBREX in the APC and PreSAP trials was 400 to 800 mg daily for up to 3 years [see Special Studies Adenomatous Polyp Prevention Studies (14.7)]. See Table 3 for clinically significant drug interactions with celecoxib. Celecoxib and anticoagulants such as warfarin have a synergistic effect on bleeding. The concomitant use of Celecoxib and anticoagulants have an increased risk of serious bleeding compared to the use of either drug alone. Intervention: Monitor patients with concomitant use of CELEBREX with anticoagulants (e.g., warfarin), antiplatelet agents (e.g., aspirin), selective serotonin reuptake inhibitors (SSRIs), and serotonin norepinephrine reuptake inhibitors (SNRIs) for signs of bleeding [see Warnings and Precautions (5.11)]. Clinical Impact: Controlled clinical studies showed that the concomitant use of NSAIDs and analgesic doses of aspirin does not produce any greater therapeutic effect than the use of NSAIDs alone. In a clinical study, the concomitant use of an NSAID and aspirin was associated with a significantly increased incidence of GI adverse reactions as compared to use of the NSAID alone [see Warnings and Precautions (5.2)]. In two studies in healthy volunteers, and in patients with osteoarthritis and established heart disease respectively, celecoxib (200–400 mg daily) has demonstrated a lack of interference with the cardioprotective antiplatelet effect of aspirin (100–325 mg). Intervention: Concomitant use of CELEBREX and analgesic doses of aspirin is not generally recommended because of the increased risk of bleeding [see Warnings and Precautions (5.11)]. CELEBREX is not a substitute for low dose aspirin for cardiovascular protection. During concomitant use of CELEBREX and ACE-inhibitors, ARBs, or beta-blockers, monitor blood pressure to ensure that the desired blood pressure is obtained. During concomitant use of CELEBREX and ACE-inhibitors or ARBs in patients who are elderly, volume-depleted, or have impaired renal function, monitor for signs of worsening renal function [see Warnings and Precautions (5.6)]. When these drugs are administered concomitantly, , patients should be adequately hydrated. Assess renal function at the beginning of the concomitant treatment and periodically thereafter. Intervention: During concomitant use of CELEBREX with diuretics, observe patients for signs of worsening renal function, in addition to assuring diuretic efficacy including antihypertensive effects [see Warnings and Precautions (5.6)]. Intervention: During concomitant use of CELEBREX and digoxin, monitor serum digoxin levels. Intervention: During concomitant use of CELEBREX and lithium, monitor patients for signs of lithium toxicity. Celebrex has no effect on methotrexate pharmacokinetics. Intervention: During concomitant use of CELEBREX and methotrexate, monitor patients for methotrexate toxicity. Clinical Impact: Concomitant use of CELEBREX and cyclosporine may increase cyclosporine's nephrotoxicity. Intervention: During concomitant use of CELEBREX and cyclosporine, monitor patients for signs of worsening renal function. Clinical Impact: Concomitant use of Celecoxib with other NSAIDs or salicylates (e.g., diflunisal, salsalate) increases the risk of GI toxicity, with little or no increase in efficacy [see Warnings and Precautions (5.2)]. Clinical Impact: Concomitant use of CELEBREX and pemetrexed may increase the risk of pemetrexed-associated myelosuppression, renal, and GI toxicity (see the pemetrexed prescribing information). Intervention: During concomitant use of CELEBREX and pemetrexed, in patients with renal impairment whose creatinine clearance ranges from 45 to 79 mL/min, monitor for myelosuppression, renal and GI toxicity. Clinical Impact: Celecoxib metabolism is predominantly mediated via cytochrome P450 (CYP) 2C9 in the liver. Co-administration of celecoxib with drugs that are known to inhibit CYP2C9 (e.g. fluconazole) may enhance the exposure and toxicity of celecoxib whereas co-administration with CYP2C9 inducers (e.g. rifampin) may lead to compromised efficacy of celecoxib. Intervention Evaluate each patient's medical history when consideration is given to prescribing celecoxib. A dosage adjustment may be warranted when celecoxib is administered with CYP2C9 inhibitors or inducers. Intervention Evaluate each patient's medical history when consideration is given to prescribing celecoxib. A dosage adjustment may be warranted when celecoxib is administered with CYP2D6 substrates. Clinical Impact: Concomitant use of corticosteroids with CELEBREX may increase the risk of GI ulceration or bleeding. Intervention Monitor patients with concomitant use of CELEBREX with corticosteroids for signs of bleeding [see Warnings and Precautions (5.2)]. Pregnancy Category C. Pregnancy category D from 30 weeks of gestation onward. Use of NSAIDs, including CELEBREX, during the third trimester of pregnancy increases the risk of premature closure of the fetal ductus arteriosus. Avoid use of NSAIDs, including CELEBREX, in pregnant women starting at 30 weeks of gestation. There are no adequate and well-controlled studies of CELEBREX in pregnant women. Data from observational studies regarding potential embryofetal risks of NSAID use in women in the first or second trimesters of pregnancy are inconclusive. In animal reproduction studies, embryo-fetal deaths and an increase in diaphragmatic hernias were observed in rats administered celecoxib daily during the period of organogenesis at oral doses approximately 6 times the maximum recommended human dose of 200 mg twice daily. In addition, structural abnormalities (e.g., septal defects, ribs fused, sternebrae fused and sternebrae misshapen) were observed in rabbits given daily oral doses of celecoxib during the period of organogenesis at approximately 2 times the MRHD [see Data]. Based on animal data, prostaglandins have been shown to have an important role in endometrial vascular permeability, blastocyst implantation, and decidualization. In animal studies, administration of prostaglandin synthesis inhibitors such as celecoxib, resulted in increased pre- and post-implantation loss. The estimated background risk of major birth defects and miscarriage for the indicated population is unknown. All pregnancies have a background risk of birth defect, loss, or other adverse outcomes. In the general U.S. population, all clinically recognized pregnancies, regardless of drug exposure, have a background rate of 2–4% for major malformations, and 15–20% for pregnancy loss. 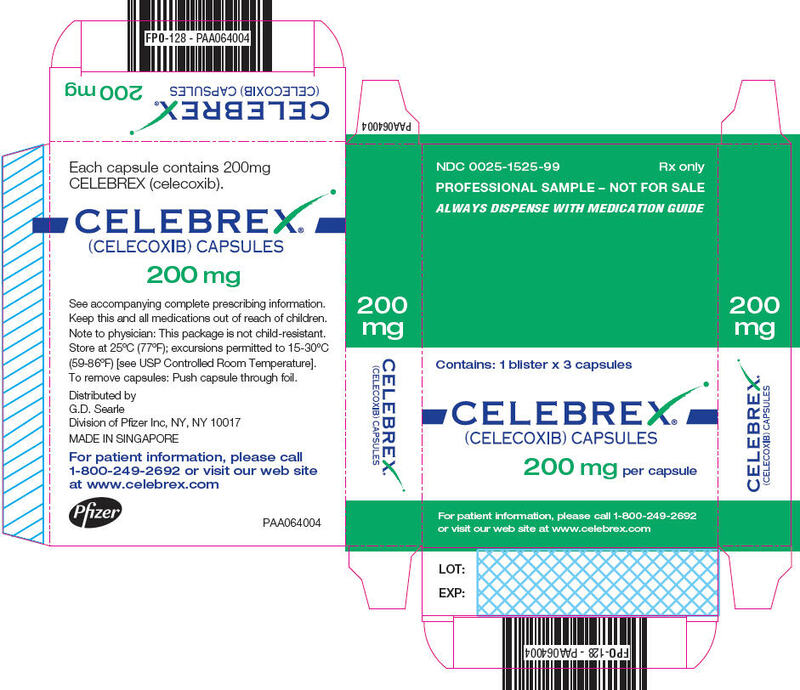 There are no studies on the effects of CELEBREX during labor or delivery. In animal studies, NSAIDs, including celecoxib, inhibit prostaglandin synthesis, cause delayed parturition, and increase the incidence of stillbirth. The available data do not establish the presence or absence of developmental toxicity related to the use of Celebrex. Celecoxib at oral doses ≥150 mg/kg/day (approximately 2 times the human exposure at 200 mg twice daily as measured by AUC0–24), caused an increased incidence of ventricular septal defects, a rare event, and fetal alterations, such as ribs fused, sternebrae fused and sternebrae misshapen when rabbits were treated throughout organogenesis. A dose-dependent increase in diaphragmatic hernias was observed when rats were given celecoxib at oral doses ≥30 mg/kg/day (approximately 6 times human exposure based on the AUC0–24 at 200 mg twice daily for RA) throughout organogenesis. In rats, exposure to celecoxib during early embryonic development resulted in pre-implantation and post-implantation losses at oral doses ≥50 mg/kg/day (approximately 6 times human exposure based on the AUC0–24 at 200 mg twice daily for RA). Celecoxib produced no evidence of delayed labor or parturition at oral doses up to 100 mg/kg in rats (approximately 7-fold human exposure as measured by the AUC0–24 at 200 mg twice daily). The effects of CELEBREX on labor and delivery in pregnant women are unknown. Limited data from 3 published reports that included a total of 12 breastfeeding women showed low levels of CELEBREX in breast milk. The calculated average daily infant dose was 10–40 mcg/kg/day, less than 1% of the weight-based therapeutic dose for a two-year old-child. A report of two breastfed infants 17 and 22 months of age did not show any adverse events. Caution should be exercised when CELEBREX is administered to a nursing woman. The developmental and health benefits of breastfeeding should be considered along with the mother's clinical need for CELEBREX and any potential adverse effects on the breastfed infant from the CELEBREX or from the underlying maternal condition. Based on the mechanism of action, the use of prostaglandin-mediated NSAIDs, including CELEBREX, may delay or prevent rupture of ovarian follicles, which has been associated with reversible infertility in some women. Published animal studies have shown that administration of prostaglandin synthesis inhibitors has the potential to disrupt prostaglandin mediated follicular rupture required for ovulation. Small studies in women treated with NSAIDs have also shown a reversible delay in ovulation. Consider withdrawal of NSAIDs, including CELEBREX, in women who have difficulties conceiving or who are undergoing investigation of infertility. CELEBREX is approved for relief of the signs and symptoms of Juvenile Rheumatoid Arthritis in patients 2 years and older. Safety and efficacy have not been studied beyond six months in children. The long-term cardiovascular toxicity in children exposed to CELEBREX has not been evaluated and it is unknown if long-term risks may be similar to that seen in adults exposed to CELEBREX or other COX-2 selective and non-selective NSAIDs [(see Boxed Warning, Warnings and Precautions (5.12), and Clinical Studies (14.3)]. The use of celecoxib in patients 2 years to 17 years of age with pauciarticular, polyarticular course JRA or in patients with systemic onset JRA was studied in a 12-week, double-blind, active controlled, pharmacokinetic, safety and efficacy study, with a 12-week open-label extension. Celecoxib has not been studied in patients under the age of 2 years, in patients with body weight less than 10 kg (22 lbs), and in patients with active systemic features. Patients with systemic onset JRA (without active systemic features) appear to be at risk for the development of abnormal coagulation laboratory tests. In some patients with systemic onset JRA, both celecoxib and naproxen were associated with mild prolongation of activated partial thromboplastin time (APTT) but not prothrombin time (PT). When NSAIDs including celecoxib are used in patients with systemic onset JRA, monitor patients for signs and symptoms of abnormal clotting or bleeding, due to the risk of disseminated intravascular coagulation. Patients with systemic onset JRA should be monitored for the development of abnormal coagulation tests [see Dosage and Administration (2.4), Warnings and Precautions (5.12), Adverse Reactions (6.3), Animal Toxicology (13.2), Clinical Studies (14.3)]. Alternative therapies for treatment of JRA should be considered in pediatric patients identified to be CYP2C9 poor metabolizers [see Poor Metabolizers of CYP2C9 substrates (8.8)]. Of the total number of patients who received CELEBREX in pre-approval clinical trials, more than 3,300 were 65–74 years of age, while approximately 1,300 additional patients were 75 years and over. No substantial differences in effectiveness were observed between these subjects and younger subjects. In clinical studies comparing renal function as measured by the GFR, BUN and creatinine, and platelet function as measured by bleeding time and platelet aggregation, the results were not different between elderly and young volunteers. However, as with other NSAIDs, including those that selectively inhibit COX-2, there have been more spontaneous post-marketing reports of fatal GI events and acute renal failure in the elderly than in younger patients [see Warnings and Precautions (5.4, 5.6)]. The daily recommended dose of CELEBREX capsules in patients with moderate hepatic impairment (Child-Pugh Class B) should be reduced by 50%. The use of CELEBREX in patients with severe hepatic impairment is not recommended [see Dosage and Administration (2.6) and Clinical Pharmacology (12.3)]. CELEBREX is not recommended in patients with severe renal insufficiency [see Warnings and Precautions (5.6) and Clinical Pharmacology (12.3)]. In patients who are known or suspected to be poor CYP2C9 metabolizers (i.e., CYP2C9*3/*3), based on genotype or previous history/experience with other CYP2C9 substrates (such as warfarin, phenytoin) administer CELEBREX starting with half the lowest recommended dose. Alternative management should be considered in JRA patients identified to be CYP2C9 poor metabolizers. [see Dosage and Administration (2.6) and Clinical Pharmacology (12.5)]. 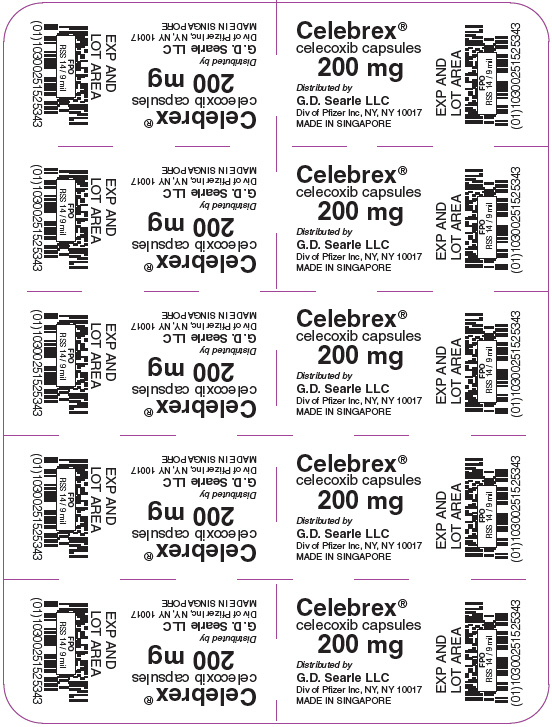 No overdoses of CELEBREX were reported during clinical trials. Doses up to 2400 mg/day for up to 10 days in 12 patients did not result in serious toxicity. No information is available regarding the removal of celecoxib by hemodialysis, but based on its high degree of plasma protein binding (>97%) dialysis is unlikely to be useful in overdose. 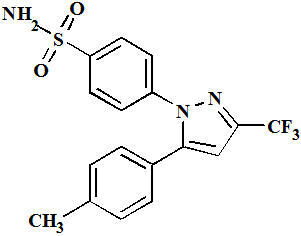 Celecoxib is a white to off-white powder with a pKa of 11.1 (sulfonamide moiety). Celecoxib is hydrophobic (log P is 3.5) and is practically insoluble in aqueous media at physiological pH range. The inactive ingredients in CELEBREX include: croscarmellose sodium, edible inks, gelatin, lactose monohydrate, magnesium stearate, povidone and sodium lauryl sulfate. 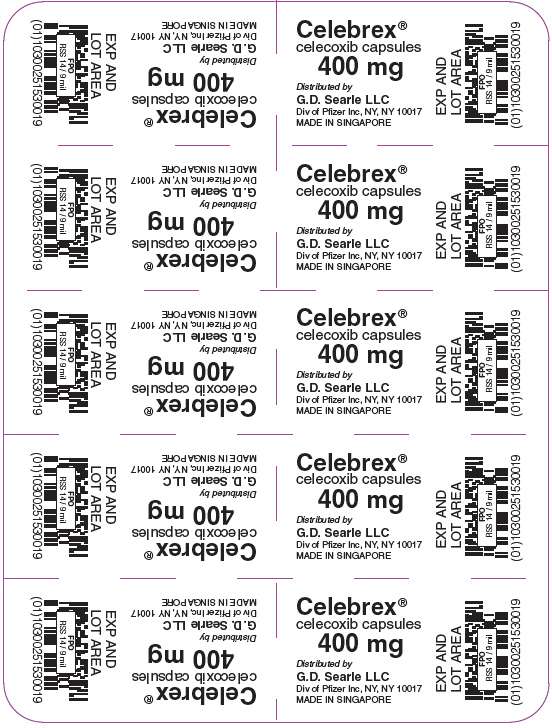 CELECOXIB has analgesic, anti-inflammatory, and antipyretic properties. The mechanism of action of CELEBREX is believed to be due to inhibition of prostaglandin synthesis, primarily via inhibition of cyclooxygenase-2 (COX-2). Celecoxib is a potent inhibitor of prostaglandin synthesis in vitro. Celecoxib concentrations reached during therapy have produced in vivo effects. Prostaglandins sensitize afferent nerves and potentiate the action of bradykinin in inducing pain in animal models. Prostaglandins are mediators of inflammation. Since celecoxib is an inhibitor of prostaglandin synthesis, its mode of action may be due to a decrease of prostaglandins in peripheral tissues. Celecoxib exhibits dose-proportional increase in exposure after oral administration up to 200 mg twice daily and less than proportional increase at higher doses. It has extensive distribution and high protein binding. It is primarily metabolized by CYP2C9 with a half-life of approximately 11 hours. Peak plasma levels of celecoxib occur approximately 3 hrs after an oral dose. Under fasting conditions, both peak plasma levels (Cmax) and area under the curve (AUC) are roughly dose-proportional up to 200 mg twice daily; at higher doses there are less than proportional increases in Cmax and AUC [see Food Effects]. Absolute bioavailability studies have not been conducted. With multiple dosing, steady-state conditions are reached on or before Day 5. The pharmacokinetic parameters of celecoxib in a group of healthy subjects are shown in Table 4. When CELEBREX capsules were taken with a high fat meal, peak plasma levels were delayed for about 1 to 2 hours with an increase in total absorption (AUC) of 10% to 20%. Under fasting conditions, at doses above 200 mg, there is less than a proportional increase in Cmax and AUC, which is thought to be due to the low solubility of the drug in aqueous media. Coadministration of CELEBREX with an aluminum- and magnesium-containing antacids resulted in a reduction in plasma celecoxib concentrations with a decrease of 37% in Cmax and 10% in AUC. CELEBREX, at doses up to 200 mg twice daily, can be administered without regard to timing of meals. Higher doses (400 mg twice daily) should be administered with food to improve absorption. In healthy adult volunteers, the overall systemic exposure (AUC) of celecoxib was equivalent when celecoxib was administered as intact capsule or capsule contents sprinkled on applesauce. There were no significant alterations in Cmax, Tmax or t1/2 after administration of capsule contents on applesauce [see Dosage and Administration (2)]. Celecoxib metabolism is primarily mediated via CYP2C9. Three metabolites, a primary alcohol, the corresponding carboxylic acid and its glucuronide conjugate, have been identified in human plasma. These metabolites are inactive as COX-1 or COX-2 inhibitors. At steady state, elderly subjects (over 65 years old) had a 40% higher Cmax and a 50% higher AUC compared to the young subjects. In elderly females, celecoxib Cmax and AUC are higher than those for elderly males, but these increases are predominantly due to lower body weight in elderly females. Dose adjustment in the elderly is not generally necessary. However, for patients of less than 50 kg in body weight, initiate therapy at the lowest recommended dose [see Dosage and Administration (2.7) and Use in Specific Populations (8.5)]. The steady state pharmacokinetics of celecoxib administered as an investigational oral suspension was evaluated in 152 JRA patients 2 years to 17 years of age weighing ≥10 kg with pauciarticular or polyarticular course JRA and in patients with systemic onset JRA. Population pharmacokinetic analysis indicated that the oral clearance (unadjusted for body weight) of celecoxib increases less than proportionally to increasing weight, with 10 kg and 25 kg patients predicted to have 40% and 24% lower clearance, respectively, compared with a 70 kg adult RA patient. Twice-daily administration of 50 mg capsules to JRA patients weighing ≥12 to ≤25 kg and 100 mg capsules to JRA patients weighing >25 kg should achieve plasma concentrations similar to those observed in a clinical trial that demonstrated the non-inferiority of celecoxib to naproxen 7.5 mg/kg twice daily (see Dosage and Administration (2.4). Celecoxib has not been studied in JRA patients under the age of 2 years, in patients with body weight less than 10 kg (22 lbs), or beyond 24 weeks. A pharmacokinetic study in subjects with mild (Child-Pugh Class A) and moderate (Child-Pugh Class B) hepatic impairment has shown that steady-state celecoxib AUC is increased about 40% and 180%, respectively, above that seen in healthy control subjects. Therefore, the daily recommended dose of CELEBREX capsules should be reduced by approximately 50% in patients with moderate (Child-Pugh Class B) hepatic impairment. Patients with severe hepatic impairment (Child-Pugh Class C) have not been studied. The use of CELEBREX in patients with severe hepatic impairment is not recommended [see Dosage and Administration (2.6) and Use in Specific Populations (8.6)]. In a cross-study comparison, celecoxib AUC was approximately 40% lower in patients with chronic renal insufficiency (GFR 35–60 mL/min) than that seen in subjects with normal renal function. No significant relationship was found between GFR and celecoxib clearance. Patients with severe renal insufficiency have not been studied. Similar to other NSAIDs, CELEBREX is not recommended in patients with severe renal insufficiency [see Warnings and Precautions (5.6)]. In vitro studies indicate that celecoxib is not an inhibitor of cytochrome P450 2C9, 2C19 or 3A4. When NSAIDs were administered with aspirin, the protein binding of NSAIDs were reduced, although the clearance of free NSAID was not altered. The clinical significance of this interaction is not known. See Table 3 for clinically significant drug interactions of NSAIDs with aspirin [see Drug Interactions (7)]. In a study conducted in healthy subjects, mean steady-state lithium plasma levels increased approximately 17% in subjects receiving lithium 450 mg twice daily with CELEBREX 200 mg twice daily as compared to subjects receiving lithium alone [see Drug Interactions (7)]. Concomitant administration of fluconazole at 200 mg once daily resulted in a two-fold increase in celecoxib plasma concentration. This increase is due to the inhibition of celecoxib metabolism via P450 2C9 by fluconazole [see Drug Interactions (7)]. The effects of celecoxib on the pharmacokinetics and/or pharmacodynamics of glyburide, ketoconazole, [see Drug Interactions (7)], phenytoin, and tolbutamide have been studied in vivo and clinically important interactions have not been found. CYP2C9 activity is reduced in individuals with genetic polymorphisms that lead to reduced enzyme activity, such as those homozygous for the CYP2C9*2 and CYP2C9*3 polymorphisms. Limited data from 4 published reports that included a total of 8 subjects with the homozygous CYP2C9*3/*3 genotype showed celecoxib systemic levels that were 3- to 7-fold higher in these subjects compared to subjects with CYP2C9*1/*1 or *I/*3 genotypes. The pharmacokinetics of celecoxib have not been evaluated in subjects with other CYP2C9 polymorphisms, such as *2, *5, *6, *9 and *11. It is estimated that the frequency of the homozygous *3/*3 genotype is 0.3% to 1.0% in various ethnic groups. [see Dosage and Administration (2.6), Use in Specific Populations (8.8)]. Celecoxib was not carcinogenic in Sprague-Dawley rats given oral doses up to 200 mg/kg for males and 10 mg/kg for females (approximately 2-to 4-times the human exposure as measured by the AUC0–24 at 200 mg twice daily) or in mice given oral doses up to 25 mg/kg for males and 50 mg/kg for females (approximately equal to human exposure as measured by the AUC0–24 at 200 mg twice daily) for two years. Celecoxib had no effect on male or female fertility or male reproductive function in rats at oral doses up to 600 mg/kg/day (approximately 11-times human exposure at 200 mg twice daily based on the AUC0–24). At ≥50 mg/kg/day (approximately 6-times human exposure based on the AUC0–24 at 200 mg twice daily) there was increased preimplantation loss. CELEBREX has demonstrated significant reduction in joint pain compared to placebo. CELEBREX was evaluated for treatment of the signs and the symptoms of OA of the knee and hip in placebo- and active-controlled clinical trials of up to 12 weeks duration. In patients with OA, treatment with CELEBREX 100 mg twice daily or 200 mg once daily resulted in improvement in WOMAC (Western Ontario and McMaster Universities) osteoarthritis index, a composite of pain, stiffness, and functional measures in OA. In three 12-week studies of pain accompanying OA flare, CELEBREX doses of 100 mg twice daily and 200 mg twice daily provided significant reduction of pain within 24–48 hours of initiation of dosing. At doses of 100 mg twice daily or 200 mg twice daily the effectiveness of CELEBREX was shown to be similar to that of naproxen 500 mg twice daily. Doses of 200 mg twice daily provided no additional benefit above that seen with 100 mg twice daily. A total daily dose of 200 mg has been shown to be equally effective whether administered as 100 mg twice daily or 200 mg once daily. CELEBREX has demonstrated significant reduction in joint tenderness/pain and joint swelling compared to placebo. CELEBREX was evaluated for treatment of the signs and symptoms of RA in placebo- and active-controlled clinical trials of up to 24 weeks in duration. CELEBREX was shown to be superior to placebo in these studies, using the ACR20 Responder Index, a composite of clinical, laboratory, and functional measures in RA. CELEBREX doses of 100 mg twice daily and 200 mg twice daily were similar in effectiveness and both were comparable to naproxen 500 mg twice daily. Although CELEBREX 100 mg twice daily and 200 mg twice daily provided similar overall effectiveness, some patients derived additional benefit from the 200 mg twice daily dose. Doses of 400 mg twice daily provided no additional benefit above that seen with 100-200 mg twice daily. In a 12-week, randomized, double-blind active-controlled, parallel-group, multicenter, non-inferiority study, patients from 2 years to 17 years of age with pauciarticular, polyarticular course JRA or systemic onset JRA (with currently inactive systemic features), received one of the following treatments: celecoxib 3 mg/kg (to a maximum of 150 mg) twice daily; celecoxib 6 mg/kg (to a maximum of 300 mg) twice daily; or naproxen 7.5 mg/kg (to a maximum of 500 mg) twice daily. The response rates were based upon the JRA Definition of Improvement greater than or equal to 30% (JRA DOI 30) criterion, which is a composite of clinical, laboratory, and functional measures of JRA. The JRA DOI 30 response rates at week 12 were 69%, 80% and 67% in the celecoxib 3 mg/kg twice daily, celecoxib 6 mg/kg twice daily, and naproxen 7.5 mg/kg twice daily treatment groups, respectively. The efficacy and safety of CELEBREX for JRA have not been studied beyond six months. The long-term cardiovascular toxicity in children exposed to CELEBREX has not been evaluated and it is unknown if the long-term risk may be similar to that seen in adults exposed to CELEBREX or other COX-2 selective and non-selective NSAIDs [(see Boxed Warning, Warnings and Precautions (5.12)]. CELEBREX was evaluated in AS patients in two placebo- and active-controlled clinical trials of 6 and 12 weeks duration. 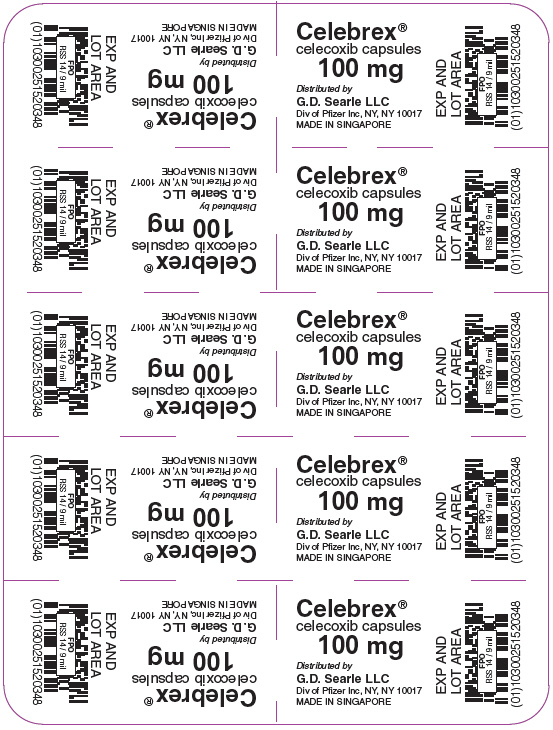 CELEBREX at doses of 100 mg twice daily, 200 mg once daily and 400 mg once daily was shown to be statistically superior to placebo in these studies for all three co-primary efficacy measures assessing global pain intensity (Visual Analogue Scale), global disease activity (Visual Analogue Scale) and functional impairment (Bath Ankylosing Spondylitis Functional Index). In the 12-week study, there was no difference in the extent of improvement between the 200 mg and 400 mg CELEBREX doses in a comparison of mean change from baseline, but there was a greater percentage of patients who responded to CELEBREX 400 mg, 53%, than to CELEBREX 200 mg, 44%, using the Assessment in Ankylosing Spondylitis response criteria (ASAS 20). The ASAS 20 defines a responder as improvement from baseline of at least 20% and an absolute improvement of at least 10 mm, on a 0 to 100 mm scale, in at least three of the four following domains: patient global pain, Bath Ankylosing Spondylitis Functional Index, and inflammation. The responder analysis also demonstrated no change in the responder rates beyond 6 weeks. In acute analgesic models of post-oral surgery pain, post-orthopedic surgical pain, and primary dysmenorrhea, CELEBREX relieved pain that was rated by patients as moderate to severe. Single doses [see Dosage and Administration (2.6)] of CELEBREX provided pain relief within 60 minutes. The PRECISION trial was a double-blind randomized controlled trial of cardiovascular safety in OA and RA patients with or at high risk for cardiovascular disease comparing celecoxib with naproxen and ibuprofen. Patients were randomized to a starting dose of 100 mg twice daily of celecoxib, 600 mg three times daily of ibuprofen, or 375 mg twice daily of naproxen, with the option of escalating the dose as needed for pain management. Based on labeled doses, OA patients randomized to celecoxib could not dose escalate. The primary endpoint, the Antiplatelet Trialists' Collaboration (APTC) composite, was an independently adjudicated composite of cardiovascular death (including hemorrhagic death), non-fatal myocardial infarction, and non-fatal stroke with 80% power to evaluate non-inferiority. All patients were prescribed open-label esomeprazole (20–40 mg) for gastroprotection. Treatment randomization was stratified by baseline low-dose aspirin use. Additionally, there was a 4-month substudy assessing the effects of the three drugs on blood pressure as measured by ambulatory monitoring. Among subjects with OA, only 0.2% (17/7259) escalated celecoxib to the 200 mg twice daily dose, whereas 54.7% (3946/7208) escalated ibuprofen to 800 mg three times daily, and 54.8% (3937/7178) escalated naproxen to the 500 mg twice daily dose. Among subjects with RA, 55.7% (453/813) escalated celecoxib to the 200 mg twice daily dose, 56.5% (470/832) escalated ibuprofen to 800 mg three times daily, and 54.6% (432/791) escalated naproxen to the 500 mg twice daily dose; however, the RA population accounted for only 10% of the trial population. Because relatively few celecoxib patients overall (5.8% [470/8072]) dose-escalated to 200 mg twice daily, the results of the PRECISION trial are not suitable for determining the relative CV safety of celecoxib at 200 mg twice daily compared to ibuprofen and naproxen at the doses taken. Celecoxib, at the 100 mg twice daily dose, as compared with either naproxen or ibuprofen at the doses taken, met all four prespecified non-inferiority criteria (p<0.001 for non-inferiority in both comparisons) for the APTC endpoint, a composite of cardiovascular death (including hemorrhagic death), non-fatal myocardial infarction, and non-fatal stroke (See Table 5). Non-inferiority was prespecified as a hazard ratio (HR) of ≤1.12 in both ITT and mITT analyses, and upper 95% CI of ≤1.33 for ITT analysis and ≤1.40 for mITT analysis. The primary analysis results for ITT and mITT are described in Table 5. In the ITT analysis population through 30 months, all-cause mortality was 1.6% in the celecoxib group, 1.8% in the ibuprofen group, and 2.0% in the naproxen group. In the PRECISION-ABPM substudy, among the total of 444 analyzable patients at Month 4, celecoxib dosed at 100 mg twice daily decreased mean 24-hour systolic blood pressure (SBP) by 0.3 mmHg, whereas ibuprofen and naproxen at the doses taken increased mean 24-hour SBP by 3.7 and 1.6 mmHg, respectively. These changes resulted in a statistically significant and clinically meaningful difference of 3.9 mmHg (p=0.0009) between celecoxib and ibuprofen and a non-statistically significant difference of 1.8 (p=0.119) mmHg between celecoxib and naproxen. In the APC trial, the hazard ratios compared to placebo for a composite endpoint (adjudicated) of cardiovascular death, myocardial infarction, or stroke were 3.4 (95% CI 1.4 – 8.5) with celecoxib 400 mg twice daily and 2.8 (95% CI 1.1 – 7.2) with celecoxib 200 mg twice daily. Cumulative rates for this composite endpoint over 3 years were 3.0% (20/671 subjects) and 2.5% (17/685 subjects), respectively, compared to 0.9% (6/679 subjects) with placebo treatment. The increases in both celecoxib dose groups versus placebo-treated patients were mainly due to an increased incidence of myocardial infarction. In the PreSAP trial, the hazard ratio for this same composite endpoint (adjudicated) was 1.2 (95% CI 0.6 – 2.4) with celecoxib 400 mg once daily compared to placebo. Cumulative rates for this composite endpoint over 3 years were 2.3% (21/933 subjects) and 1.9% (12/628 subjects), respectively. Clinical trials of other COX-2 selective and non-selective NSAIDs of up to three-years duration have shown an increased risk of serious cardiovascular thrombotic events, myocardial infarction, and stroke, which can be fatal. As a result, all NSAIDs are considered potentially associated with this risk. This was a prospective, long-term, safety outcome study conducted post-marketing in approximately 5,800 OA patients and 2,200 RA patients. Patients received CELEBREX 400 mg twice daily (4-fold and 2-fold the recommended OA and RA doses, respectively), ibuprofen 800 mg three times daily or diclofenac 75 mg twice daily (common therapeutic doses). Median exposures for CELEBREX (n = 3,987) and diclofenac (n = 1,996) were 9 months while ibuprofen (n = 1,985) was 6 months. The primary endpoint of this outcome study was the incidence of complicated ulcers (gastrointestinal bleeding, perforation or obstruction). Patients were allowed to take concomitant low-dose (≤ 325 mg/day) aspirin (ASA) for cardiovascular prophylaxis (ASA subgroups: CELEBREX, n = 882; diclofenac, n = 445; ibuprofen, n = 412). Differences in the incidence of complicated ulcers between CELEBREX and the combined group of ibuprofen and diclofenac were not statistically significant. Patients on CELEBREX and concomitant low-dose ASA (N=882) experienced 4-fold higher rates of complicated ulcers compared to those not on ASA (N=3105). The Kaplan-Meier rate for complicated ulcers at 9 months was 1.12% versus 0.32% for those on low-dose ASA and those not on ASA, respectively [see Warnings and Precautions (5.4)]. The estimated cumulative rates at 9 months of complicated and symptomatic ulcers for patients treated with CELEBREX 400 mg twice daily are described in Table 7. Table 7 also displays results for patients less than or greater than 65 years of age. The difference in rates between CELEBREX alone and CELEBREX with ASA groups may be due to the higher risk for GI events in ASA users. In a small number of patients with a history of ulcer disease, the complicated and symptomatic ulcer rates in patients taking CELEBREX alone or CELEBREX with ASA were, respectively, 2.56% (n=243) and 6.85% (n=91) at 48 weeks. These results are to be expected in patients with a prior history of ulcer disease [see Warnings and Precautions (5.4) and Adverse Reactions (6.1)]. Cardiovascular safety outcomes were also evaluated in the CLASS trial. Kaplan-Meier cumulative rates for investigator-reported serious cardiovascular thromboembolic adverse events (including MI, pulmonary embolism, deep venous thrombosis, unstable angina, transient ischemic attacks, and ischemic cerebrovascular accidents) demonstrated no differences between the CELEBREX, diclofenac, or ibuprofen treatment groups. The cumulative rates in all patients at nine months for CELEBREX, diclofenac, and ibuprofen were 1.2%, 1.4%, and 1.1%, respectively. The cumulative rates in non-ASA users at nine months in each of the three treatment groups were less than 1%. The cumulative rates for myocardial infarction in non-ASA users at nine months in each of the three treatment groups were less than 0.2%. There was no placebo group in the CLASS trial, which limits the ability to determine whether the three drugs tested had no increased risk of CV events or if they all increased the risk to a similar degree. In the CLASS study, the Kaplan-Meier cumulative rates at 9 months of peripheral edema in patients on CELEBREX 400 mg twice daily (4-fold and 2-fold the recommended OA and RA doses, respectively), ibuprofen 800 mg three times daily and diclofenac 75 mg twice daily were 4.5%, 6.9% and 4.7%, respectively. The rates of hypertension from the CLASS trial in the CELEBREX, ibuprofen and diclofenac-treated patients were 2.4%, 4.2% and 2.5%, respectively. A randomized, double-blind study in 430 RA patients was conducted in which an endoscopic examination was performed at 6 months. The incidence of endoscopic ulcers in patients taking CELEBREX 200 mg twice daily was 4% vs. 15% for patients taking diclofenac SR 75 mg twice daily. However, CELEBREX was not statistically different than diclofenac for clinically relevant GI outcomes in the CLASS trial [see Clinical Studies (14.7)]. Advise the patient to read the FDA-approved patient labeling (Medication Guide) that accompanies each prescription dispensed. Inform patients, families, or their caregivers of the following information before initiating therapy with CELEBREX and periodically during the course of ongoing therapy. Inform patients of the warning signs and symptoms of hepatotoxicity (e.g., nausea, fatigue, lethargy, pruritus, diarrhea jaundice, right upper quadrant tenderness, and "flu-like" symptoms). If these occur, instruct patients to stop CELEBREX and seek immediate medical therapy [see Warnings and Precautions (5.3), Use in Specific Populations (8.6)]. Advise patients to stop CELEBREX immediately if they develop any type of rash and to contact their healthcare provider as soon as possible [see Warnings and Precautions (5.9)]. Advise females of reproductive potential who desire pregnancy that NSAIDs, including CELEBREX, may be associated with a reversible delay in ovulation [see Use in Specific Populations (8.3)]. Inform pregnant women to avoid use of CELEBREX and other NSAIDs starting at 30 weeks of gestation because of the risk of the premature closing of the fetal ductus arteriosus [see Warnings and Precautions (5.10) and Use in Specific Populations (8.1)]. Inform patients that the concomitant use of CELEBREX with other NSAIDs or salicylates (e.g., diflunisal, salsalate) is not recommended due to the increased risk of gastrointestinal toxicity, and little or no increase in efficacy [see Warnings and Precautions (5.2) and Drug Interactions (7)]. Alert patients that NSAIDs may be present in "over the counter" medications for treatment of colds, fever, or insomnia. Inform patients not to use low-dose aspirin concomitantly with CELEBREX until they talk to their healthcare provider [see Drug Interactions (7)].